Reading isn't just about decoding words. Good readers use a variety of reading strategies to make sense of text. They make predictions, ask questions, tap into prior knowledge, make inferences and make sense of what they read. Now that my 6 year old is a "fluent" reader, meaning that she reads quickly, accurately and with proper expression my main focus is on continuing to help her develop her reading comprehension. We have of course always focused on comprehension by doing simple activities such as asking questions before, during and after reading and summarizing the stories we read. Now that she has moved past the need to decode as many words while reading, we can really work on developing her reading comprehension skills and overall vocabulary. We can move from being a "reader" to being a "good reader". In order to be a good reader children not only need to be able to read fluently but they must also be able to make sense of what they read. How can we help our children become good readers? How can we encourage them to make connections to what they read? Reading comprehension and the building of vocabulary is a huge focus in 1st grade. As both a mom and an educator, I know that education begins here at home, with me. Although both Lil Divas are being taught reading strategies at school, I know how important it is to continue to build on what they learning at school, here at home. Of course, after a long day at school the last thing the Lil Divas want to do is sit and work some more. How do I combat this? By making our learning fun. We play games, read books they want to read and work on activities that are both inviting and engaging. The Lil Divas love to play. They enjoy board games, computer games, apps - well you get the idea. So I am always willing to let them try educational toys such as Hot Dots whose aim is to help children develop various skills such as reading comprehension, vocabulary, phonics, math, science and social studies. 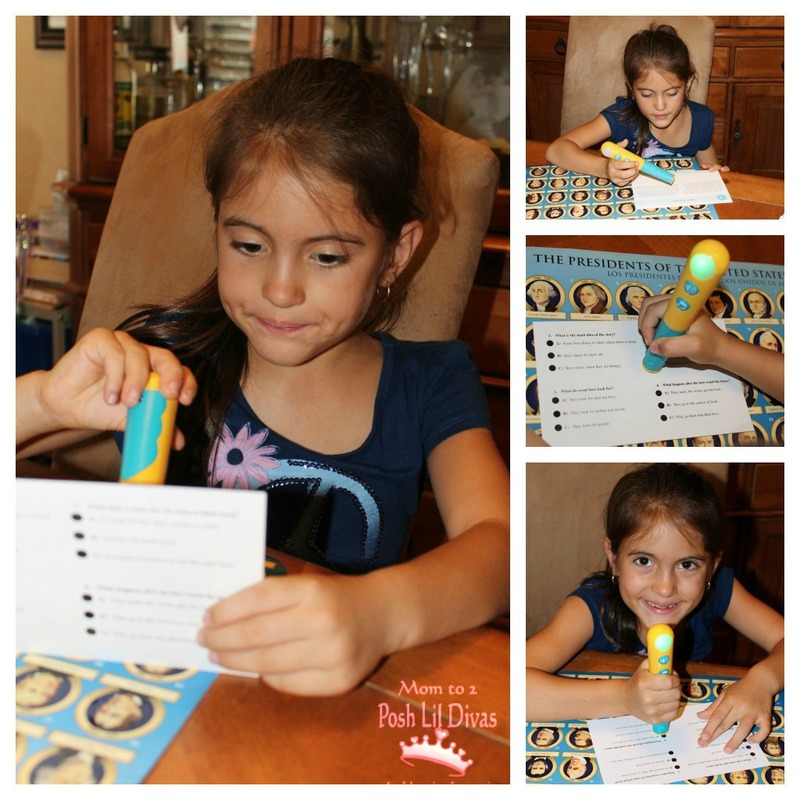 We were recently given the opportunity to review the interactive Talking Hot Dots Pen along with Phonics Flash Cards - Blends & Digraphs, Reading Comprehension Cards - Getting the Main Idea and Laugh It Up Vocabulary Cards - Synonyms by Educational Insights. You know that we have had a relationship with this company for some time and they never disappoint. You can check out some of our previous reviews here. This set was perfect for my 1st grader. We have previously used the Hot Dots Jr - Ace the Talking Dog Pen so she was familiar with the way it works and welcomed using a "big kid" version of the pen and "harder" cards - her words. The Pen works much like our old friend Ace. It is interactive and great for independent learning. A simple press to the card gives an immediate response - a green light and positive answer means you were correct and a red light and "Whoops! Not it", or other such response let you know it was not correct and encourages the child to try again. The reading comprehension card set includes 50 leveled cards with short stories (a few paragraphs) and 4 multiple choice questions on the back. I like that there are varying levels and different genres represented. The Oldest Diva was able to choose titles that appealed to her and work on reading comprehension - understanding the main idea independently. This was great to have when I was working with the Littlest Diva on homework. It provided us with an activity that was beneficial, she found it fun and she could do it 100% on her own with me listening to the pen to give me an idea of how she was doing. I could hear the pen congratulate the Oldest Diva when she was correct and let her know when she was incorrect so that she could try again. The Oldest Diva enjoyed the phonics blends & digraphs card sets as well. 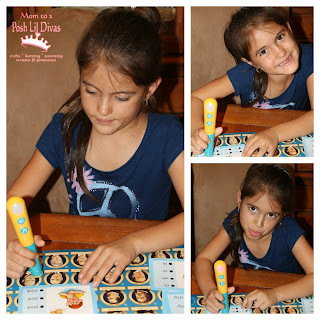 They were fairly easy for her so I have been using them with my Kindergartener and she finds them challenging. The synonym cards were more of a challenge. We usually work on these together but I like that they are helping enrich her vocabulary. It gives us an opportunity to talk about new words and I have caught her using a few of them in conversation. Isn't that fabulous? The Hot Dots Pen & card sets have been a wonderful learning tool in our home. We have not experienced any technical issues with the pen and both girls find it very easy to use. It's been a wonderful independent learning tool for 1st grader and I can see this being an asset in the classroom as well as in the home. This would be great at an independent reading learning center. 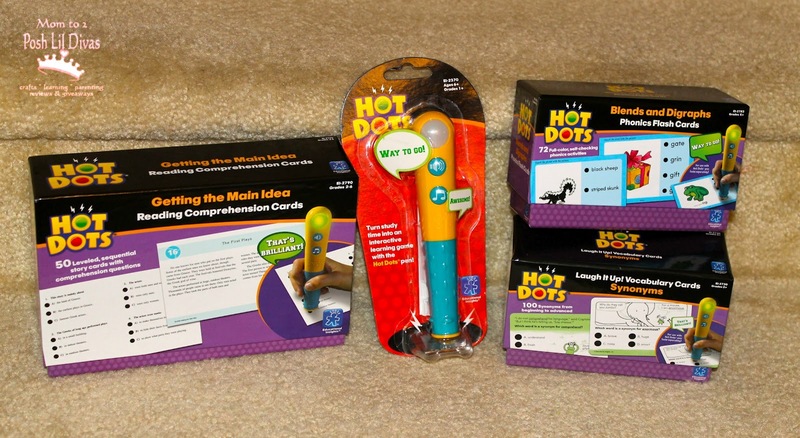 Onto the fun stuff - the fabulous people over at Educational Insights are giving away a Hot Dots Pen and 2 card sets (of choice!) to one lucky Mom to 2 Posh Lil Divas reader. Yay! Isn't that an awesome giveaway? Entering the giveaway is easy peasy - just use the rafflecopter form below to enter to win. This one is open to both US & Canada residents and ends on October 11, 2012. See official sweepstakes rules here. Disclaimer - I received the products mentioned in this post free from Educational Insights in order to facilitate this review. The opinions expressed are 100% my own and based on our personal experiences with the products. Your experience and opinions may differ. I have been wanting one of these for our almost 5 year old! 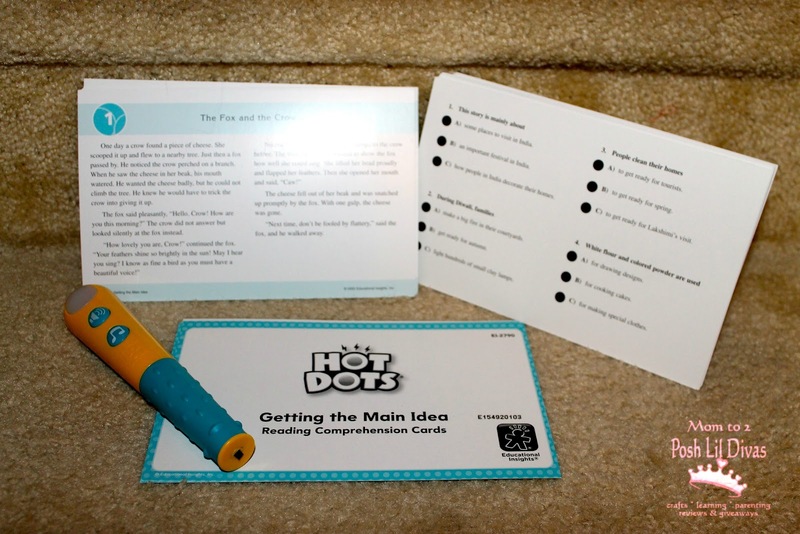 He is delayed for his age, so I would love the Hot Dots Phonics Actitivty Cards, and the Hot Dots Learn to Solve Word Problems Sets Grades 1-3. What a great product.I'd love a phonics set for my Kindergarten class and the multiplication facts for my 4th grader! The phonics ones would be great for my son! Love this! I'm a children's librarian and something like this would be great! My daughter would also love this, she can't get enough educational games. I would love to try these with my children!! Looks like a great product!!! And I forgot to say which 2. Astronomy and earth and weather. My daughter can't get enough about those! I would choose the Synonyms and the Antonyms sets. Thank you! Would love to try these with my beginning reader! I would love the Reading Comprehension and Phonics Cards. I would love to win the Phonic Cards and the Reading Comprehension. I work with special needs students and they would love to work with these items. I would like the phonics activities consonants cards and the phonics blends and diagraphs. 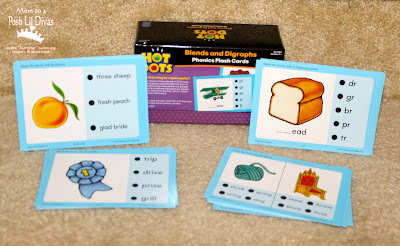 I would love any of the Phonics Activity Cards ~ so it is hard to choose just two. I would like the reading comprehension cards and phonic cards. Thanks for this card giveaway. I would like the human body set and fractions. the phonics and digraphs are a good place to start! I'd be happy winning them. 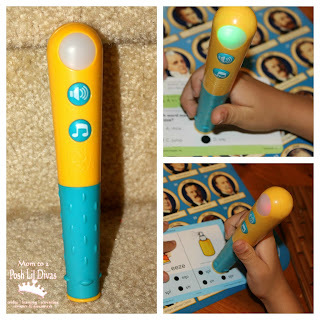 I have a 3 & 5 year old so we are on a venture to learn to read soon!he Phonics Pad would be great but also like the Design & Drill® Activity Center. This would be great for my 6 year old, he's also doing well with reading but improving his reading comprehension with a tool he can use on his own is fabulous! Oops! I made that comment anonymous! There we go! Oooh, I would love to have some of these for my kids! 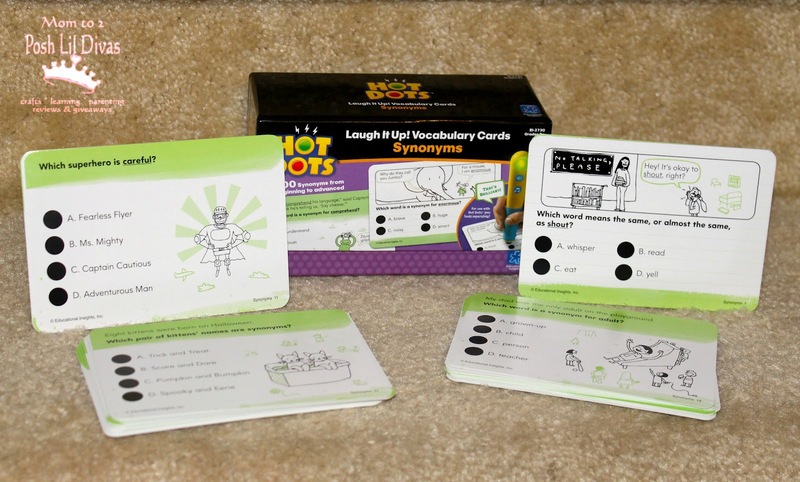 I would like to try Hot Dots® Phonics Activity Cards, Reading Readiness and the Hot Dots® Phonics Activity Cards, Word Families. I have a beginners set for my youngest, would love a set for my older two! I would love a set for my daughter she is 4 and she is beginning to read, she engages in all the learning activities and she will enjoy one set very much. It sounds like she will benefit from it very much.